COLUMBUS, Georgia – Realtree Daily Multivitamins help you stay at the top of your game throughout hunting season and the rest of the year. This vitamin offers multi-system support for optimal health by supporting heart health, bones, immune and digestive systems, nervous and hormone systems. The Realtree Multivitamin is made with whole foods, not synthetic fillers. Whole foods help mirror how nutrients are naturally absorbed from the diet. The 42 fruit and vegetable proprietary blend and essential minerals result in enhanced absorption by the body. You'll get Non-GMO fruits and vegetables every day. Vitamins A an D support safe outdoor activity. Many hunters, campers and hikers are spending time outdoors in early morning or late night. Vitamin A is a common deficiency, but is important because it supports low-light eyesight to help support safe outdoor activity. Vitamin D is naturally made by the skin when exposed to sunlight. Vitamin D is a common deficiency, especially for those that are out when sunlight is not visible (early morning, dusk). The Vitamin B-complex is essential to the body’s energy production system – something that is important for outdoor activity. However, B12 is a common vitamin deficienciy in the US. 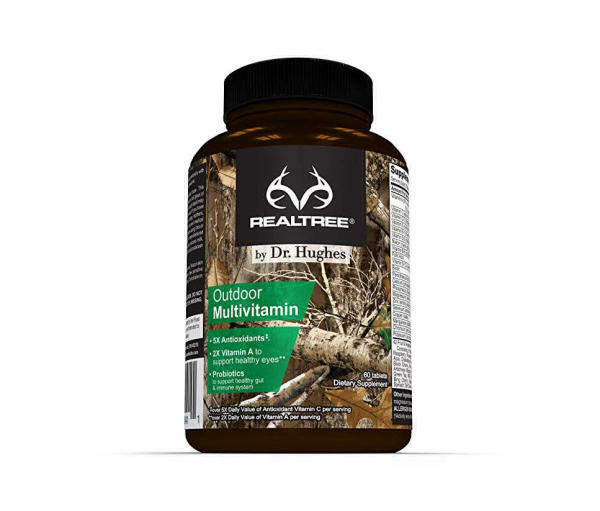 The Realtree Multvitamin contains premium levels of Vitamins B12, B6, B2 and B1. Unlike most multivitamins, the Realtree Multivitamin contains Vitamin B4 (Choline), B8 (Inositol), and B10 (PABA) – making for a complete B Vitamin for energy. The Realtree multivitamin is made in the USA. You get a month's supply of 60 tablets, made according to cGMP stardards at an NSF-certified facility that has been approved by the FDA. Use with pride and confidence.